Over the past three years, EMLO has been working with the inspirational AHRC-funded Curious Travellers project. Headed by Dr Mary-Ann Constantine at the Centre for Advanced Welsh and Celtic Studies [CAWCS], University of Wales, Aberystwyth, and Professor Nigel Leask, Regius Chair of English Language and Literature at the School of Critical Studies, Glasgow University, this research team is focussed on the writings and correspondence of the Welsh naturalist, travel writer, and antiquarian Thomas Pennant (1726–1798). Dr Sarah Ward’s call for ‘Curious Traveller’ volunteer students. Pennant was born and based throughout his life at his family’s estate, Downing Hall, Flintshire, in north-east Wales.1 With the publication of his Tours through Wales and Scotland,2 he was responsible for capturing public imagination and engendering widespread enthusiasm for travel and early ‘tourism’ in both countries. Educated initially in Wrexham, and then at the Fulham school of Dr (or Mr) Thomas Croft — the scene of the tragic accident that took place just six years prior to his arrival, while the son of Elizabeth Compton attended the school, which resulted in the death of Dr Croft’s sister, Ann —3 the young naturalist continued his studies at Queen’s College, and then Oriel College, Oxford. Pennant’s interest in natural history had been sparked (according to his own account)4 at the age of about twelve when his relative John Salisbury gave him a copy of Francis Willughby’s Ornithology.5 Although the brief of the Curious Travellers project is to concentrate primarily on Pennant’s letters of most relevance to his Tours, the team is compiling also an inventory of his complete correspondence. Thus far, metadata for the letters that reside in the care of the Bodleian Libraries, The Linnean Society of London, and the Lewis Walpole Library, Yale, have been drawn together and published in EMLO. 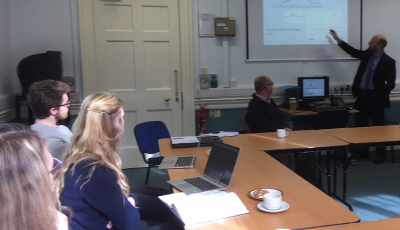 It was in the spirit of Pennant that EMLO set off ‘on the road’ once again last week to help host a workshop at the University of the West of England in Bristol, courtesy of an erstwhile EMLO Digital Fellow and current UWE member of staff, Dr Sarah Ward. A call had been circulated early in March and, within hours, twelve of Dr Ward’s undergraduate students had signed up, together with Laura Lawrence, a current EMLO Digital Fellow, to spend an afternoon working with photographic images to generate rough transcriptions of Pennant’s letters from the collections of the Bodleian Libraries, including MS. Ashmole 1822 (Pennant’s letters to the museum curator William Huddesford) and MS. Gough Gen. Top. 43 (Pennant’s letters to the antiquarian Richard Gough). Although Pennant’s handwriting and punctuation were felt to be a little eccentric at times (but thankfully Dr Constantine was on hand to help), these letters turned out to be brimful with tantalizing details of natural history specimens, including striped antelopes, various horns and fossils, five-toed lizards, and bats. The transcriptions created by these remarkably talented students, all whom are to be credited for their contributions, will be checked and edited by the Curious Travellers team, and additional work on Pennant’s letters to Gough will be conducted in Oxford later this year when Dr Constantine takes up residence at the Bodleian as a visiting scholar (upon which occasion we hope very much that a follow-up workshop involving these wonderful students will be arranged — and, in the meantime, should anyone with an interest in Pennant wish to sign up as a volunteer transcriber, please be in touch . . . ). 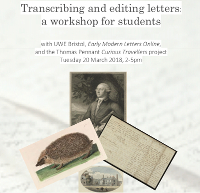 Students at the Curious Travellers/EMLO/UWE workshop, Bristol, 20 March 2018. This entry was posted in Uncategorized on March 31, 2018 by Miranda Lewis. Having been here, there, and everywhere in recent weeks (I’ll put out more posts shortly on the ‘there’ and the ‘everywhere’), I’m dreadfully behind at present with announcements of EMLO’s latest catalogues, for which apologies to all concerned. In the first instance, I’m acutely aware that publication of the inventory of the Huguenot refugee Jean Claude’s correspondence a full two-and-a-half weeks ago is still to be celebrated. 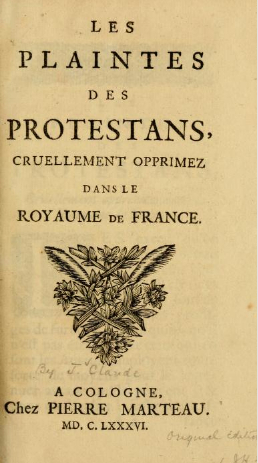 Despite experiencing intensifying persecution, Jean Claude (1619–1687) persisted in his attempts to explain and defend the Calvinist religion through the delivery of sermons, participation in disputations, and via the publication and circulation of learned treatises. Ever a defendant of Calvinist theology, Claude was reluctant to leave his native France, even to the extent of declining the offer of the chair in theology at the University of Groningen and preferring to remain at his church. The Frenchman fled finally to Dutch Republic only when, following the Revocation of the Edict of Nantes on 22 October 1685, he was given just twenty-four hours to leave the country. Having worked ceaselessly for the Calvinist cause in Nîmes, Montauban, and — from 1666 — at the Huguenot temple at Charenton, the pastor headed north with his wife, Elisabeth, for a reunion in The Hague with their son Isaac, who had moved and settled in the city three years previously. The inventory of Claude’s letters forms part of a converging cluster of Huguenot correspondence in EMLO that will increase significantly later this year. The correspondence has been calendared by Dr David van der Linden, a scholar based at the University of Groningen. Dr van der Linden has published extensively on Huguenots in the Dutch Republic (see Experiencing Exile: Huguenot Refugees in the Dutch Republic, 1680–1700)1 and he is involved in a number of related research projects, including Divided by Memory: Coping with Religious Diversity ​in Post-Civil War France, 1598–1685 and the pioneering initiative Signed, Sealed, and Undelivered. The research team focussed on the latter is hard at work investigating, cataloguing, and describing the material features of the extraordinary and fascinating postal archive known as the Brienne Collection, which is now in the care of the Museum voor Communicatie in The Hague. I’ve included a link to Claude’s final work; it’s well worth the read. This entry was posted in Uncategorized on March 26, 2018 by Miranda Lewis. On a day when I should have been in Manchester presenting a paper on Bodleian Student Editions at a workshop organized by the The Lives and Afterlives of Letters Network (but, due to widespread travel disruptions in England as winter extends its tentacles into spring, I am not), it seems a perfect moment to pause and reflect upon the serendipity and coincidence that have been at play within EMLO and at the Cultures of Knowledge project over the past week. Lias: the Journal of Early Modern Intellectual Culture and its Sources is a peer-reviewed publication which takes its name from the Dutch work for ‘file’; it is committed to publishing primary sources that relate to the intellectual and cultural history of early modern Europe. The journal was established to provide a platform for sources that are relatively short in length. 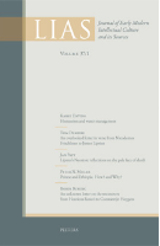 And it is in the pages of this journal that Hollis’s edition of the Elstob-Ballard correspondence may be consulted, either by subscription or through the purchase of a single hard-copy issue; and should users be within a subscribing institution, links to the downloadable text are provided from each relevant letter record in EMLO. The journal’s editor-in-chief, Dirk van Miert, is Assistant Professor of Early Modern Cultural History at the University of Utrecht, where he specializes in the history of knowledge. And it is the second time in as many weeks that I have been posting his name, for here lies one of this week’s many coincidences: eagle-eyes may have spotted that Professor van Miert has been in Oxford to present a paper at the Early Modern Intellectual History seminar organized by Dr Dmitri Levitin and Sir Noel Malcolm. Professor van Miert’s talk bore the riveting title ‘The “Hairy War” (1640–50) and the historicization of the Bible: the role of philology in a public debate on men wearing long hair in the Dutch Republic’, and post delivery (before he had been given so much as the opportunity to catch his breath, let alone check his own hair! ), Professor van Miert was requisitioned for an ‘EMLO Gathering’ in the History Faculty in the form of a pop-up Q&A session (see my previous post) concerning his work as co-editor on The Correspondence of Joseph Justus Scaliger, which was published by Librairie Droz, Geneva, in 2012. Bodleian Student Editions students and EMLO Digital Fellows at the Q&A pop-up session with Dirk van Miert. Here we encounter another coincidence: this pop-up Q&A session offered the opportunity to learn more about scholarly editing both to students who have signed up to the Bodleian Student Editions workshops and to EMLO’s loyal, hard-working Digital Fellows who help prepare epistolary metadata for upload into the union catalogue. Bodleian Student Editions, which began in 2016, built on the initiative EMLO had started the previous year with Oxford second-year undergraduates who were taking the Further Subject ‘Writing in the early modern period’ taught by Professor Giora Sternberg. These Further Subject undergraduates worked with a small sub-set of EMLO’s existing metadata contained within the Bodleian card catalogue: they checked and enhanced dates, authors, recipients, origins, destinations, and shelfmarks of letters (for, as we know all too well, this sizeable catalogue is not always as reliable as might be wished) and, as they studied the manuscripts in the Bodleian’s special collections, they created a number of transcriptions. Long-standing followers of this blog may recall some of the announcements of the resulting student-generated catalogues: one for Elizabeth Compton, for example, another for Sarah Chapone (who was, in turn, a good friend to Elizabeth Elstob). Now, this week, students have been in action again with Bodleian Student Editions and Thursday witnessed the concluding workshop for this Hilary term and the transcription of a third batch of Penelope Maitland’s letters to her friend Charlotte [née Perry] West. (Charlotte turned out to be the daughter of Sampson Perry, proprietor of the radical journal The Argus.) Once again, student editors continued throughout the day to capture metadata, transcribe text, and footnote the letters’ contents. This was just one of the aspects of the Bodleian Student Editions scheme I was due to speak about at the Manchester workshop, which had been conceived to explore various approaches to the editing of texts. Thankfully the workshop will not become a snow casualty and it is likely to be rescheduled for a date in May. Thus a single week has produced a myriad of unexpected twists and, instead of travelling home from Manchester tonight, I am contemplating a remarkable plait of intertwined catalogues (each built upon the foundations of metadata taken from the Bodleian’s collections, and each contributing to the Early Modern Women’s Letters Online [WEMLO] cluster, something to be celebrated as we move towards 8 March and International Women’s Day). And of course, thanks to Professor van Miert, I am left pondering in addition the subject of hair! This entry was posted in Uncategorized on March 2, 2018 by Miranda Lewis.